The stock market went down today on a fear of the US going into an air strike against Syria. Trump tweeted about nice, new, and smart missiles coming to Syria and Russians if they keep supporting Syria. Again, Trump opened his big mouth and the market reacted on his blabbing. Not facts, just his tweets. However, it was surprising to see that investors and traders didn’t over react on those “news” and the market remained relatively calm. The loss was only about 5 points. Then FOMC meeting notes were released and the market slid almost 15 points. Overall, it was still a quiet day. Today’s trading helped a few of our trades today. Many of the put spreads with today’s expiration I opened last week and even this morning expired worthless or were closed for 0.05 debit and thus for a profit. This helped our net-liq as it jumped up again by almost $3,000 dollars today. This brings to me a question I keep hearing from novice traders lately that they lost money and whether I am making money or losing. 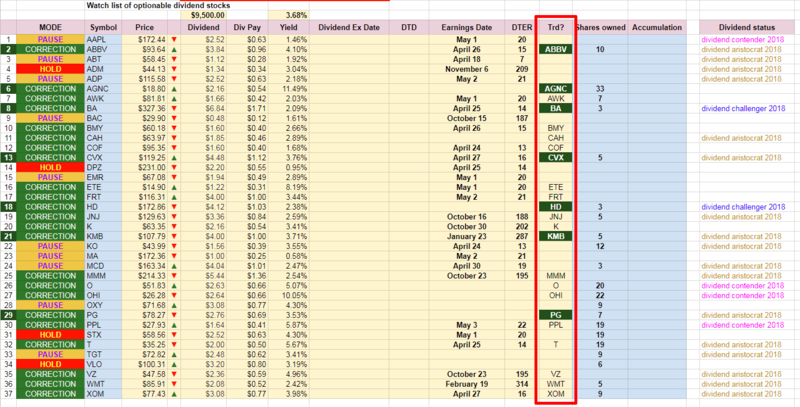 There is a misunderstanding how to read my financial results and overall results of options trading. Tracking results of an options trader is not as easy as when tracking stocks. When you buy a stock, you can see right away whether you are making money or losing. Yet even if you are long a stock and the stock goes down, you are losing money but if you do not sell, it is just a paper loss, unrealized loss. You may have found people saying: loss is loss no matter whether on paper or realized. I disagree. I buy stocks for a long haul and if they go down and bring in income then there is nothing to force me to sell (unlike when investing using 4% rule) and thus to me it is just a paper loss which over time will recover. With options, it is similar. As long as my trade is open and I do not have to close it, the loss is just a volatility loss, or delta loss. But theta works in my favor and eventually, that trade will end either OTM, ATM, or ITM. If it ends OTM, or ATM I make money and my net liq will jump back up. If it remains ITM at expiration, my net liq will stay depressed, I roll the trade and the net-liq stays down until the trade ends OTM (or I reverse it from puts to calls, for example). To me, it is a temporary market value. It is similar when you buy a stock, for example Facebook, the stock goes down, you keep holding, and six months from now the stock recovers and goes higher. People will say that you have lost whatever amount of money. The same saying was with Warren Buffett when people and talking heads were saying that he lost billions on Wells Fargo, or Bank of America, or any other stock which went out of favor and got sold off. Of course, Buffett didn’t lose anything as he didn’t sell at a loss. Only a market value got reduced by a sell off. If you choose #1 option, you may be waiting for some time, maybe a year or two, but you are not at physical loss and it may recover over time. It depends on your investing/trading objective. If you however choose #2 option, you are done. The trade is closed at a loss and all you need to do is open a new trade which will hopefully recover your previous losses. Emotionally, this is a quite dangerous approach. With options I have a plethora ways to fix a bad trade – I can roll it into same strikes but longer expiration and give a trade more time, I can roll it into longer expiration and lower strikes (in case of puts), I can convert it into an opposite trade (bullish into bearish or vice versa), I can convert it into a different trade, for example a put spread into Iron Condor, Iron Butterfly, strangle, straddle, ratio spread, etc. So why bother about a temporary net-liq loss if there is a chance that in a few days, weeks, or months I can get out as a winner. However, managing bad trades can become weary too. I had that situation when bad trades kept hammering me and no matter what I was doing it kept giving me a hard time. When that happens, then yes, it is probably time to close a trade at a loss. I closed a few trades like that in my trading account in January 2018 (a few US Steel (X) strangles) at a substantial loss. With a hindsight I now see that it was a mistake. I should have waited and I could fix the trades and be out today as a winner. But I was no longer able to bear it psychologically. I became my own greatest enemy. But I learned a new lesson about market behavior and trading psychology since then and today I feel a lot better even about bad trades. More confident managing them. Why do I consider my trading not losing although my accounts net-liq value is down by 20%? It is because all my trading is cash positive. I keep opening new trades. Every new trade consumes a part of my buying power and net-liq. It is due to bid-ask spread which in high volatility market is larger than before, so the drops of net-liq values are larger too. As an old trade gets closed, a new trade is immediately opened. So my net-liq is now going higher slower than before. When the market consolidates, the net-liq will shoot back up (as I am seeing these few days already happening). But all trades are cash positive. My cash flow is positive. I bring in more cash than what I spend on adjusting bad trades. I use that cash to offset some debit adjustments. As long as all our trades will be cash net-positive, I am not losing anything. This is why I keep posting my daily trades summary with cash flow – “premiums received/paid” for our followers to see that even in this volatile market, when all traders are beaten up a lot, you can see your trading positive amid a temporary market value drop. It is difficult to say what to expect next. The Syria effect was relatively small and didn’t drag the market down. FOMC meeting minutes also had a muted effect to the market. Futures are up only a few per cent to say where the market would go next. This may be a calm before a storm and the market may shoot up from here (or a few days of going sideways) or it may tank suddenly to new marginal lows as there is a chance that we may go even lower before we find the true bottom. However, the economic conditions are deteriorating. We see a slow down in Europe and China and even US starts seeing a slow down. That is not a good thing for the market. It is not overly dramatic yet and I still think this market will make new all time highs this year but in 2019 or late 2018 we may see a beginning of a new bear market. Trump may speed it all up by his economic ignorance, mess in the White House, Cohen issue, Syria bombing, trade wars… who know what can pop up. And investors and traders no longer trust Trump and anything can rattle them and initiate a sell off. As of now, I do not see a catalyst for further selling but it may turn on a dime the very next minute. All it takes is one Trump’s tweet about whatever and the market may overreact. My stance is to raise cash by managing open trades to close them as winners and do not trade much except ultra short SPX trades (small trades) to take advantage of the market action (or lack of) but stay exposed only very little. As a dividend investor, there is no change in strategy. I will keep holding already open positions and adding more new positions as long as my options trading keeps bringing income which can be reinvested. oday, we opened a new call spread against SPX converting the existing put spreads into Iron Condor (puts opened last week and yesterday). All trades either closed for a profit or expired worthless for a profit.